It took four years, but we've finally organized the apartment. What a joy it is to wake up in what, by comparison, seems like a nearly minimalist home. The major improvements are seen in these two nooks, former fertile dumping grounds for all that would fit. 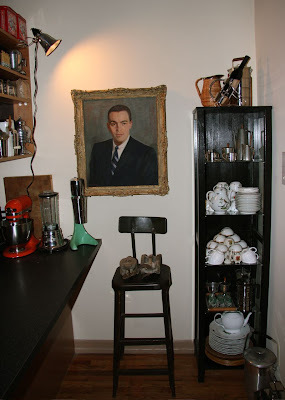 Here in the entryway, we: switched animals, added badminton rackets, removed the 15 cheapy folding umbrellas from their pile on the floor and about 900 jackets and scarves from that hook, added portrait of dad. Neither of us had been into this area next to the kitchen island in roughly a year without acrobatics and strain. We removed: solidly packed clothing rack (what had become Porter's de-facto closet) and pram filled with vintage children's clothes from our efforts with Hovey Vintage; Added: liquor previously displayed on a tray/rack thing in the "office area" to the kitchen shelves; faux lizard paper to the back of the shelves; painting; clip light. Love the way you painted the door. All other efforts to be commended; the stacking of the tea cups is terrific. Is that a little Rothschild Bird peeking through? My sister-in-law's only regret is that she didn't choose it. 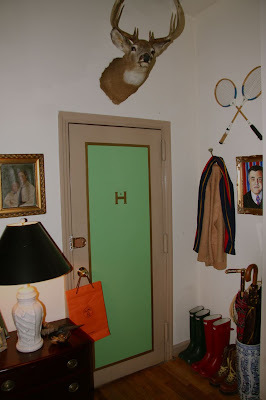 I love the green door!! Everything looks wonderful! What's going on here--is the apartment no longer painted black? Do tell, Miss Hovey. Main walls still very black! We never painted the nooks because we couldn't reach 'em! Looks like you will have to have another party! Looking sooooo good! Love the door with the "H" in the middle. I like your teacup storage. I would love to see more pictures of your apartment-- it's fabulous. Love your place. I have the same Les Oiseaux china - you have a beautiful collection.